Are you getting ready to do foster care? Here are simple ideas to enlist the help of friends and family. Right click the above image to download the template. Then, upload it to your to your very own GOOGLE DRIVE. Invite family and friends to donate items by sharing it in an email or on social media. 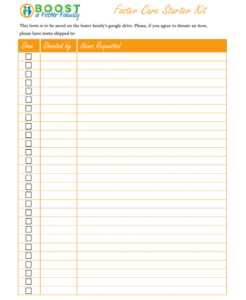 Click Here for Sample Template to personalize a request letter. Share the "explainer video" above (the one with the hand and crayon) on social media explaining your preferred way to collect email addresses from your possible donors. Paste the link of this video to YOUR social media to share. You will be pleasantly surprised how many people are willing to step up and help with your personalized requests. Ask friends and family to kindly check off the box in front of the items they agree to donate. This allows, in real time, to have a completely updated and current list so there are no duplicates. Essentially, you are creating a GIFT REGISTRY. Collect their email addresses and add it to the share box to invite them. Additionally, if you wish to receive financial donations from your family and friends consider going to www.paypal.com to create a paypal account and share your link with your donors. Paypal has a quick, easy new paypal/me option available to collect money fast. Instead of using the template, you could go to Amazon.com and /or Walmart.com and make a private wish list by following the stores' easy instructions. Share the link. Items from friends can be shipped right to your home or work.